Grasshoppers are the suborder Caelifera, including locusts. There are 11,000 species, of which 10,000 are in the family Acrididae. To distinguish grasshoppers from bush-crickets or katydids, they are sometimes referred to as the short-horned grasshopper. Species which change colour and behaviour at high population densities are called locusts. Grasshoppers prefer to eat grasses, leaves and cereal crops, but many grasshoppers are omnivorous. 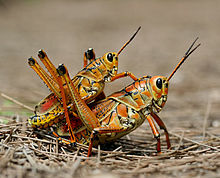 Many grasshoppers eat from several host plants in one day, while others stay on one host plant. One of the 8000 species of grasshopper eats only a single species of plant. Grasshoppers make good food for some. As an example, in southern Mexico, chapulines (grasshoppers of the genus Sphenarium) are often eaten. They are high in protein, minerals and vitamins. They are usually collected at dusk, using lamps or electric lighting, in sweep nets. Sometimes they are placed in water for 24 hours, after which they can be boiled or eaten raw, sun-dried, fried, flavoured with spices, such as garlic, onions, chilli, drenched in lime, and used in soup or as a filling for various dishes. They are abundant in Central and Southern Mexican food and street markets. ↑ O'Neill, Kevin M.; Woods, Stephen A.; Streett, Douglas A. (1997). "Grasshopper (Orthoptera: Acrididae) Foraging on grasshopper feces: observational and rubidium-labeling studies". Environmental Entomology 26 (6): 1224–1231. http://openagricola.nal.usda.gov/Record/IND21638560. Wikimedia Commons has media related to Grasshopper. Wikispecies has information on: Grasshopper. This page was last changed on 12 July 2017, at 11:03.